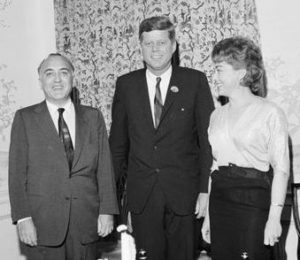 Chaim Gedaliah Rickover (1900-1986) was born in Poland. When he was six years old his family fled to the United States to escape the Russian pogroms that had killed over 3000 Jews in Eastern Europe. The family settled in Chicago, where Rickover started working at just nine years of age for three cents an hour. He excelled academically, and after graduating from high school with honours, was nominated by a Jewish congressman to the US Naval Academy. Rickover distinguished himself while serving on a destroyer ship and was among the youngest people to ever be promoted to an officer. He went back to school and earned a Master’s in electrical engineering before doing further studies at Columbia. At 29, he decided to serve on a submarine, and was soon in command of one. His translation of the German Das Unterseeboot became the textbook of the US Submarine Service. Throughout World War II, Rickover repaired electrical systems on US Navy ships, for which he earned the Legion of Merit. Following the war, he applied to join the Manhattan Project’s new program to develop nuclear power plants. 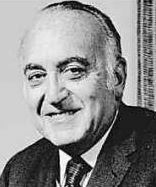 He was soon the deputy manager of the division developing nuclear-powered navy ships. 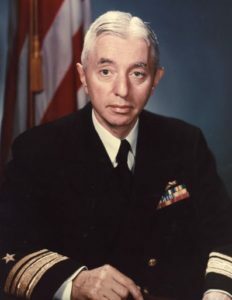 Rickover saw that the greatest potential was for nuclear submarines, and ultimately succeeded in persuading the Secretary of the Navy to endorse building one. Rickover led its development, and played a central role in designing a nuclear reactor fit for submarines. His vision came to life in 1954 with the launch of the famous USS Nautilus. It put him on the cover of TIME Magazine that year. By 1958, Rickover was vice admiral of the Navy, and awarded a Congressional Gold Medal. His program would go on to produce over 200 nuclear-powered submarines, and 23 aircraft carriers and cruisers. Incredibly, none of these has ever had a meltdown – a feat credited to Rickover’s insistence on safety and obsessive attention to detail. (The Soviet Navy suffered at least 14 meltdowns in the same time period!) Rickover became known as the “Father of the Nuclear Navy”. He was the longest serving officer in US naval history, with 63 years of service under 13 presidents. A four-star admiral, his 61 civilian awards included a Presidential Medal of Freedom and two Congressional Gold Medals (an extremely rare feat). He was also awarded 15 honourary degrees, and made an honourary Commander of the Order of the British Empire. Rickover stated that he was not proud of his work, and saw it as a “necessary evil” to protect his country. He once said he wished “nuclear power had never been discovered” and hoped that the nuclear fleet would be dismantled. Cherish criticism, for it will place you on the true heights. This entry was posted in Law, Politics & Military and tagged Admiral, Chicago, Columbia University, Commander of the Order of the British Empire, Congressional Gold Medal, Legion of Merit, Manhattan Project, Nuclear Navy, Nuclear Power, Nuclear Submarines, Polish Jews, Presidential Medal of Freedom, TIME Magazine, US Naval Academy, US Navy, USS Nautilus, World War II on March 28, 2017 by Jew of the Week.